Dance | Living life in the carpool lane.. Things my husband says… because he cares..
That’s me. 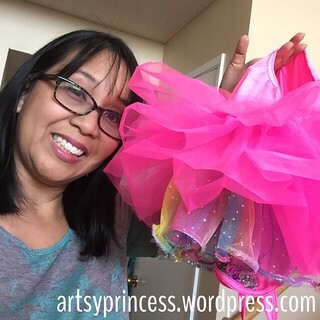 That’s M’s dance costume, upside down, to let the tutu get fluffier. She started taking dance classes in January. Her dance teacher does classes in sessions. This is her second session and the ‘recital’ session. So we have a costume. We have a required hairstyle. We have rehearsal dates. How did we get to this point? Isn’t she just my baby? Nope. She’s my big girl. She takes dance classes. She goes to preschool. She takes piano and voice lessons. She’s not a baby anymore. She’s got her own schedule. She’s got her own obligations. She’s a busy kid. I hope she enjoys the whole stage performance experience. Now, I just have to learn how to put her hair in a bun! It feels practically impossible!